as it turned out, i subsequently made very good tofu cheese cake, tiramisu, banoffee cake & pumpkin cheese cake, so i have not made the lava cake for a while. i also tried a jam crumb cake which was pretty ok too. I am generally NOT a dessert person. When dining out with family or friends, I will take the lower cost 2-course option (for set meals) & pick an appetizer & main, ostensibly also to avoid too much calories. I also have NOT baked in my entire life before this, and in any case I only started any form of serious exploring of cooking from Mar2012 when I had my first 5-course home cooked dinner for friends. It was in August 2012 after a very nice smoked meat dinner at a friend’s place, where some friends brought along a very nice tiramisu cake, that I started then to google for some dessert I can make. Well I found one which I now do rather well – the oozing chocolate lava cake. But I must say that I am both NOT motivated and luckless in finding another “worthwhile” dessert to make (worthwhile being that there is a “wow” factor in producing it & it is nearly as good or better than what you can grab from a good bakery stall). I can make a passable apple pie now but does not quite meet my “worthwhile” criteria. I had been looking at soufle recipes for a while and hopefully that would be the subject of my post in the not too distant future. 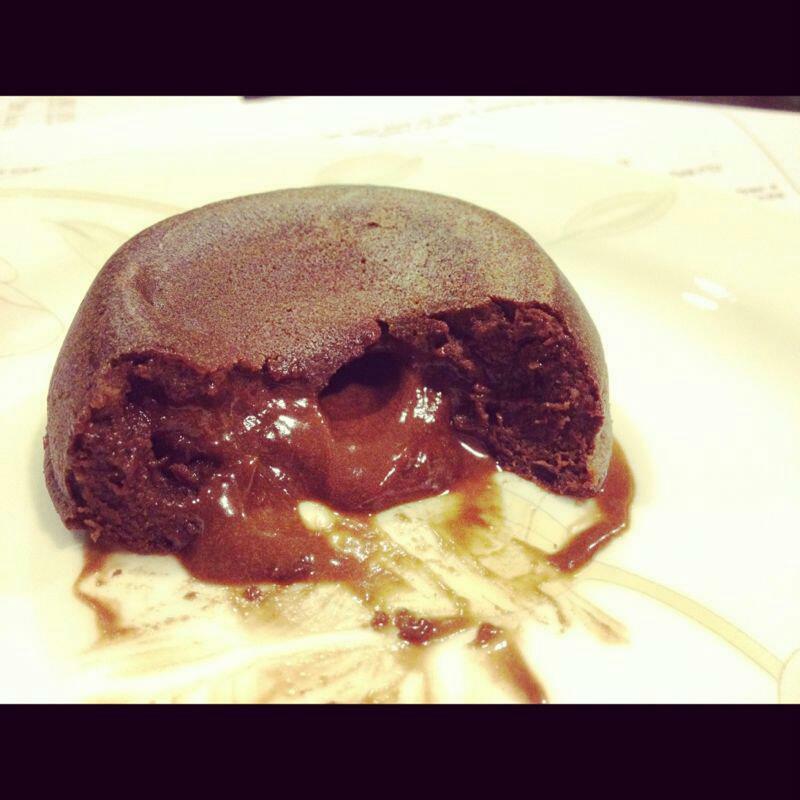 Back to the oozing chocolate lava cake. I was successful in my 3rd attempt, and thanks to Facebook for being such a faithful repository of memories, that was on 22.8.2012! Well, now I can make an awesome chocolate lava cake 99% of the time successful. It is NOT really as good as some very good ones in restaurants here but still equal or better than many. The keys to a good chocolate lava cake are (1) taste & (2) lava; otherwise it will be just a good tasting brownie! I find the 70% cocoa chocolate makes the lava cake flavour really mesmerising. I have tried Cadbury Old Gold Dark Chocolate but w/o the cocoa the taste experience is several notch down, so if you do you will need to experiment with adding cocoa to get to the right taste. For the lava, the size of the muffin tray (I still do not have ramekins! ), temperature & timing are CRITICAL; and because in this recipe the time is only 3mins 30secs, any variation & you will have to trial & error to get the correct combination. For example, I have to use the grill function at 210degC in order that the top hardens while inside is still molten & let the bottom harden further while resting for few minutes! This entry was posted in Recipes and tagged cake, chocolate, lava, tiramisu. Bookmark the permalink.